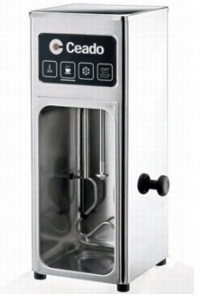 The Ceado F-12 machine is ideal frothed milk maker for professional use, designed to provide hot or cold frothed milk for cappuccino Latte, macchiato, and frozen drinks. It makes steam or frothed milk in less than a minute, so as to serve all customers quickly and easily. Binds to the steam receptor of the espresso machine, and it uses separate control knob for steam, hot or cold foam. The steam wand and the mixer can operate either collectively or individually to prepare the appropriate beverage. The machine is made entirely of durable stainless steel, it is stylish and easy to maintain.